The transforming growth factor β (TGF-β) family is a large group of structurally related proteins that drive developmental programs and control cell behavior. The TGF-β family members exert their effects by binding to receptors on the cell surface, activating intracellular signaling pathways that modulate gene expression programs that control normal cell physiology, immune responses, and a variety of developmental processes. TGF-β signaling is also important in conditions such as cancer, skeletal disorders, and cardiovascular diseases. 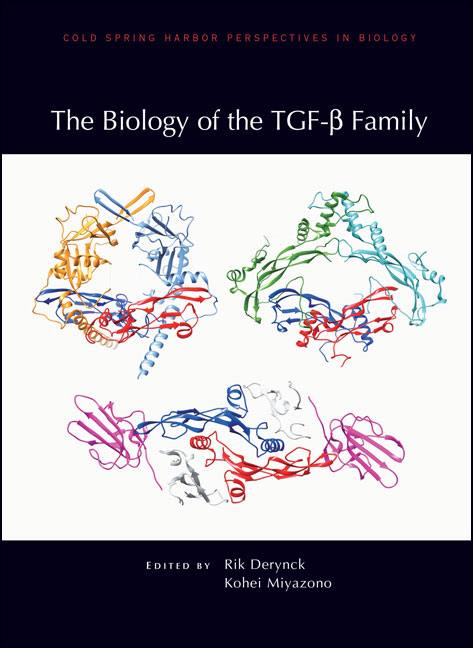 Written and edited by experts in the field, this collection from Cold Spring Harbor Perspectives in Biology provides a comprehensive view of the different members of the TGF-β family, the signaling pathways they control, and how they influence development, normal physiology, and disease. The contributors describe the various TGF-β family ligands, including activins and bone morphogenetic proteins (BMPs), the structures and functions of the type I and type II receptors, and how ligand-receptor binding is regulated. Both Smad and non-Smad signaling pathways are discussed, as is cross talk between TGF-β and other signaling pathways (e.g., Wnt). Individual chapters are devoted to the roles of TGF-β signaling in specific biological processes, including cell proliferation, mesenchymal differentiation, branching morphogenesis, stem cell biology, immunity, vascular function, reproduction, and neurobiology. The roles of TGF-β signaling in cancer, fibrosis, skeletal diseases, and other conditions, as well as prospects for therapeutics, are also covered. The authors also review TGF-β signaling in model organisms (e.g., C. elegans and Drosophila), as well as the discovery of TGF-β and early research in the field. This volume is therefore a comprehensive reference on the biology of the TGF-β family, and it will be valuable for not only cell and developmental biologists but all who wish to learn about this important field of research.